We have enjoyed a good day visiting in Israel, but I want to share word of this amazing discovery announced today by the Israel Antiquities Authority. Massive reservoir discovered near Western Wall in Jerusalem.. Photo by IAA. 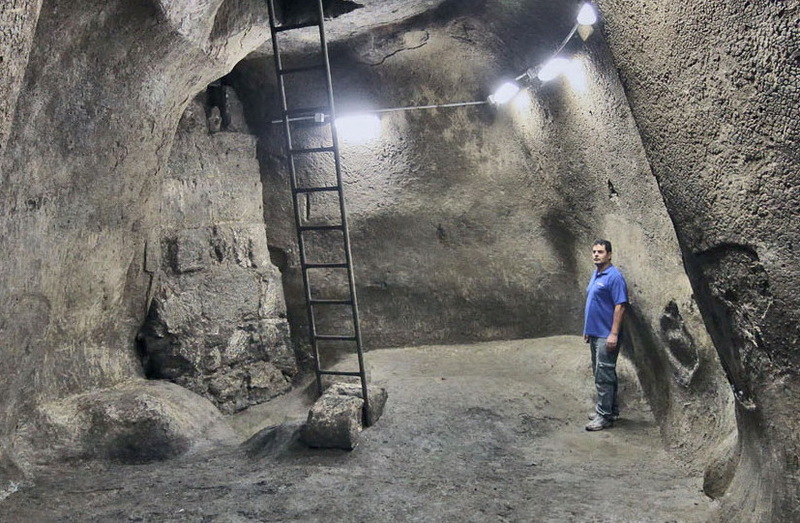 A large rock-hewn water reservoir dating to the First Temple period was discovered in the archaeological excavations that are being conducted in the Jerusalem Archaeological Garden at the foot of Robinson’s Arch. The excavations at the site are being carried out by the Israel Antiquities Authority, underwritten by the ʽIr David Foundation and in cooperation with the Nature and Parks Authority. The impressive reservoir will be presented today (Thursday) together with other finds from this past year at the 13th annual conference on the “City of David Studies of Ancient Jerusalem” to be held in Jerusalem. The excavation, during the course of which the reservoir was discovered, is part of an archaeological project whereby the entire drainage channel of Jerusalem dating to the Second Temple period is being exposed. The channel runs north along the City of David spur, from the Siloam Pool to a point beneath Robinson’s Arch. The route of the channel was fixed in the center of the main valley that extends from north to south the length of the ancient city, parallel to the Temple Mount. In his description of Jerusalem in the Second Temple period, Josephus refers to the valley by its Greek name “Tyropoeon”, which scholars believe means “Valley of the Cheese-makers”. Another interpretation identifies the valley with the “Valley of the Decision”, mentioned in the Book of Joel. It became apparent while excavating the channel that during the construction of this enormous engineering enterprise its builders had to remove earlier structures that were situated along the route of the channel and “pass through” existing rock-hewn installations that were located along it. An extraordinary installation that was exposed in recent weeks is a large water reservoir treated with several layers of plaster, which probably dates to the First Temple period. The reservoir has an approximate capacity of 250 cubic meters [66,043 U.S. gallons] and is therefore one of the largest water reservoirs from the First Temple period to be discovered so far in Jerusalem, and this was presumably a reservoir that was used by the general public. According to Eli Shukron, the excavation director on behalf of the Israel Antiquities Authority, “While excavating beneath the floor of the drainage channel a small breach in the bedrock was revealed that led us to the large water reservoir. To the best of our knowledge this is the first time that a water reservoir of this kind has been exposed in an archaeological excavation. The exposure of the current reservoir, as well as smaller cisterns that were revealed along the Tyropoeon Valley, unequivocally indicates that Jerusalem’s water consumption in the First Temple period was not solely based on the output of the Gihon Spring water works, but also on more available water resources such as the one we have just discovered. According to Dr. Tvika Tsuk, chief archaeologist of the Nature and Parks Authority and an expert on ancient water systems, “The large water reservoir that was exposed, with two other cisterns nearby, is similar in its general shape and in the kind of plaster to the light yellow plaster that characterized the First Temple period and resembles the ancient water system that was previously exposed at Bet Shemesh. In addition, we can see the hand prints of the plasters left behind when they were adding the finishing touches to the plaster walls, just like in the water reservoirs of Tel Be’er Sheva, Tel Arad and Tel Bet Shemesh, which also date to the First Temple period”. Dr. Tsuk says, “Presumably the large water reservoir, which is situated near the Temple Mount, was used for the everyday activities of the Temple Mount itself and also by the pilgrims who went up to the Temple and required water for bathing and drinking”. The exposure of the impressive water reservoir that lies below Robinson’s Arch joins a series of finds that were uncovered during recent excavations in this region of the city, indicating the existence of a densely built-up quarter that extended across the area west of the Temple Mount and predating the expansion of the Temple Mount. It seems that with the expansion of the Temple Mount compound to the west and the construction of the public buildings and the streets around the Temple Mount at the end of the Second Temple period, the buildings from the First Temple period and early Second Temple period were dismantled in this region and all that remains of them is a series of rock-cut installations, among them the hewn water reservoir. According to Dr. Yuval Baruch, archaeologist in charge of the Jerusalem Region of the Israel Antiquities Authority, “Upon completion of the excavations along the route of the drainage channel, the IAA will examine possibilities of incorporating the impressive water reservoir in the planned visitors’ path”. Click here to download high resolution photographs of the reservoir. This entry was posted in Archaeology, Bible Places, Israel, New Testament, Old Testament, Photography and tagged water. Bookmark the permalink. Congratulations to always be in front of archaeological information! yesterday, I wanted to communicate this article, http://www.haaretz.com/news/national/israeli-archaeologists-uncover-3-000-year-old-cistern-in-jerusalem.premium-1.463226 but it is restricted to subscribers. but, you are fully informed! Marvelous. This is indeed a great discovery to understand how people lived at that time, and especially during periods of drought or during wars. good trip with your group.